The next Clarion release (9.1) has over a dozen new features, and many bug fixes and changes to improve the RTL and IDE, but two new features stand out above the others. That is the support of Touch input and the support for Registration-free activation of COM objects from side-by-side assemblies. The Touch support is automatic and transparent, no code changes needed — just a rebuild of your app and you have it. But you also have the option to use an interface to take full control of all the touch events and handle them as you see fit. We have a few good examples that will show you exactly how to do that. block with assembly name equal to name of the OCX’s manifest without the “.manifest” extension (this the preferable way). Tomorrow we’ll be expanding the group of Clarion 9.1 alpha testers, and our goal is to get 9.1 to all 3rd party vendors by the end of the week. If all goes well within another ~week it’ll move to a general release. H5 will be included with a future C9.x EE. H5 will be our first Clarion Community open source project. We’ll be posting the templates and classes onto GitHub so that Clarion developers from around the world can hack, enhance, branch, and generally share their ideas and expertise (working along side our core dev team). At the conference quite a few of the Clarion devs present indicated they are looking forward to getting involved with the project, and I think there are many more who weren’t at the conference who will join in. 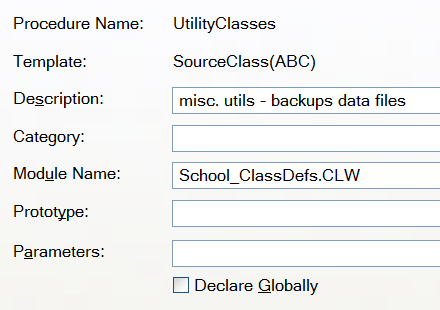 Currently we are refactoring the templates/classes to move each control into separate file(s). This is a necessary first step to ensure its easy to work on files and get them checked back into the common repository while minimizing conflicting changes. We expect to open the project on GitHub in approximately 2 weeks. At the CIDC conference we showed a template (that is already included with C9) for easily creating CLASSes within your APP. 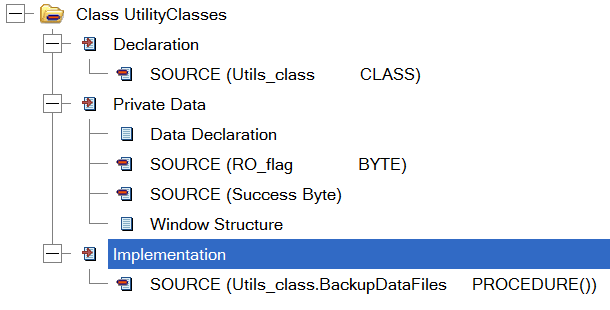 You may have noticed the other new template Procedure “Generated UserControl Class”. 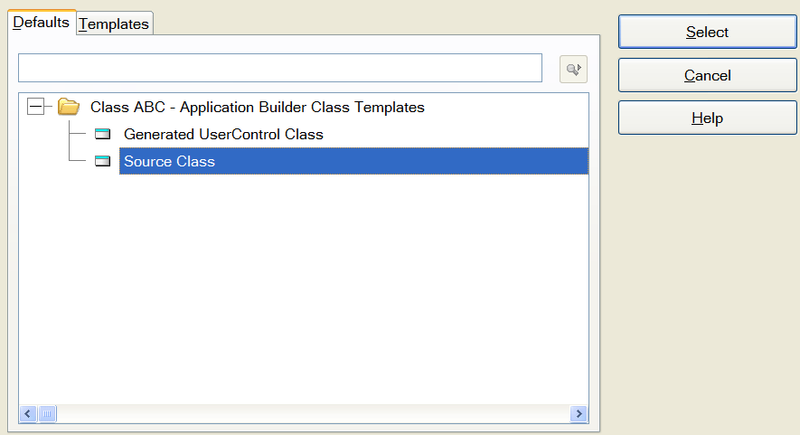 As the name implies that template creates a ‘user control’ which is comprised of a Window and all the controls on it. We’ll post separately about that one. Windows metafiles do not support all GDI functions used for drawing. For example, images with semi-transparent parts cannot be stored in Windows metafiles. Reports are sequences of bands and bands consist of controls and can be nested. Multiple drawing operations can be required to draw individual controls. For example, multiple lines and multiple strings must be drawn for LIST controls. 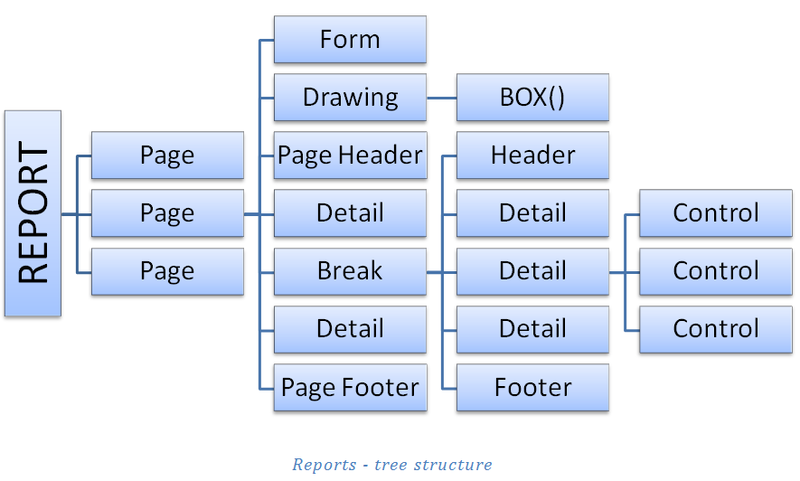 Reports are best represented as a tree structure, and metafiles with their linear organization are not an easy/adequate way to represent them. The RTL must carefully track images, pens and fonts used in metafiles to avoid leaking of resources. Problem (1) can be solved by use of Enhanced metafiles (EMF) instead of Windows metafiles (WMF). But other problems exist for both types of metafiles. The RTL must enumerate metafile records every time some delayed action needs to be executed, for example when processing widow/orphan settings to find end of page. The RTL inserts additional records into metafiles to mark logically related records and assist in enumeration and parsing both during report generation and during conversion metafiles to text/PDF/XML/HTML format. Nodes with information to execute a direct draw operation or to draw a control. A Nodes’ classes have fields for all values required to perform both drawing and post-processing: fonts, colors, pen style and width, value of the EXTEND attribute, etc. Container nodes used for referencing a list of nested nodes. Indirect nodes referencing some Container node. If the HDC parameter is a handle to a screen device context (DC), the page contents are drawn on screen. If the HDC parameter is a handle to a printer DC, the page contents are sent to the corresponding printer. If the HDC parameter is a handle to an Enhanced metafile DC, an .EMF file with the page’s image is generated. If the HDC parameter is a handle to a Windows metafile DC, a .WMF file with the page’s image is generated. is not 0, the node (and all nested nodes for container) are not drawn. Filtering nodes can be used in multiple ways, for example to exclude some pages from printing, or to show the document form at preview time but not print it without needing to re-generate the report. The program can set its own flags in high WORD of the node’s Flags field (low WORD is reserved for Clarion internal use). The program also can use node’s Custom1 and Custom2 fields to store any useful data associated with that node. Position of nodes corresponding to bands (FORM, HEADER, FOOTER, DETAIL, BREAK) is calculated relative to the page origin. Position of controls is calculated relative to the origin of the band they belong to. This allows us to have “references to containers” implemented by indirect nodes. Upon drawing/printing an indirect node the RTL uses its position, flags, custom data and a list of nested nodes of the container it points to. Indirect nodes are used internally to handle the FORM band, which is shared by all report pages. But a program can use them in other ways, for example to merge several short reports to print them on the same page, or to print a number of copies of specific pages. Faster report generation by eliminating the need for repeated re-scanning of metafiles to merge them or to find the point of a page break. Easier conversion of reports to formats other than WMF and EMF by elimination of the need to parse the WMF file to reconstruct the structure of the report in another format. Easier after-generation modification of reports, for example placing the correct total number of pages to “Page n of N” text. The possibility to have report pages with multi-layered contents and then selecting the desired layers at preview time. To distinguish between Clarion WINDOW and APPLICATION structures, and Windows OS User objects, the following text uses upper-cased WINDOW for Clarion structures and a lower-case italic font for User objects: window. Client area – rectangular part of window surface where window contents (controls) is drawing. The client area can be empty, e.g. for iconized windows. Non-client area – part of the window’s surface outside the client area. The non-client area can be empty if the client area is equal in size to the entire window rectangle. 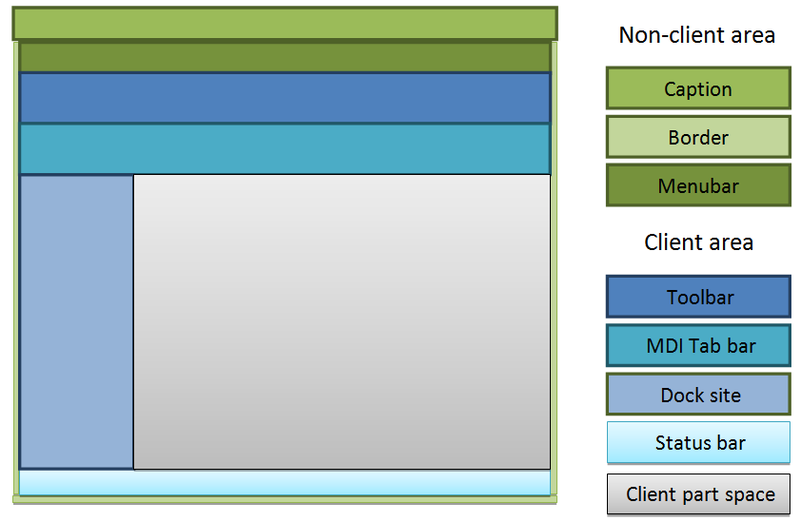 The term non-client part indicates the non-client window of a WINDOW/APPLICATION structure, and the term client part to indicate the client window area. All elements are optional depending on the actual WINDOW declaration. The non-client part is a parent window for the client-part. Coordinates of the upper-left corner of the non-client part are position of WINDOW. Width and height of the client part are the dimensions of WINDOW. The Windows OS (not the RTL) deals with the non-client part to move, size, change position in Z-order, activate, maximize, restore, iconize and hide/unhide WINDOW. 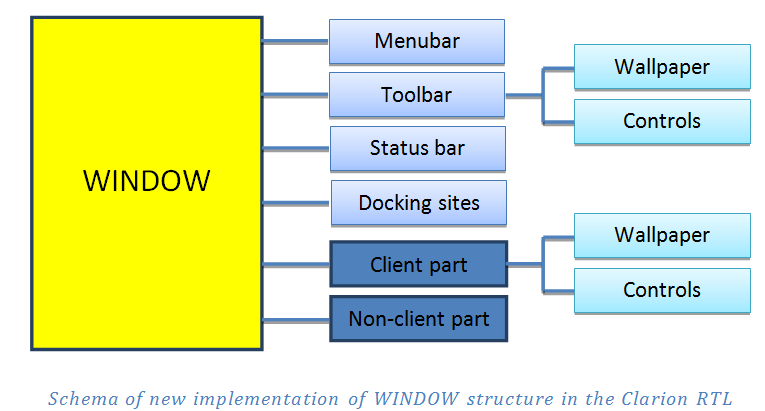 Implementation of WINDOWs in the RTL follows their (user) declared structure. In both the current version (C9) of the RTL, and all previous versions, the RTL considers non-client and client parts as a united object. The Clarion RTL creates the entire WINDOW including window objects for non-client and client parts, toolbar and other elements in the thread where the program executes the CREATE statement for that WINDOW. Because Clarion does not allow creation of MDI child WINDOWs in the Frame’s thread, the RTL uses the CreateMDIWindow API function to create the non-client part of WINDOW. The CreateMDIWindow function has been listed as one of benefits of 32-bit Windows in comparison with earlier 16-bit Windows 3.x versions because it can create an MDI child window in a different thread other than one running the frame window. But the real life implementation of the MDI API in Windows OS is not thread safe. Therefore simultaneous activity of several MDI child windows running in their own threads will eventually cause an inconsistent state of the Windows OS internal structure containing MDI-related information and, consecutively, incorrect functioning of both the MDI frame and MDI child windows in multiple ways. Since Clarion 6 was introduced and the problems with MDI were discovered huge efforts have been made to hide them for MDI child WINDOWs in Clarion. Unfortunately, there is no complete solution without changing of the internal structure of WINDOWs. The new Clarion RTL will use a new implementation of WINDOWs. The main change is that the non-client and client parts will be strictly separated. The non-client part and the client part of the same WINDOW can be created in different threads. Specifically, the non-client part of an MDI child WINDOWs can be created in the Frame’s thread. This solves all the problems caused by the thread-unsafe implementation of MDI in Windows. All the code added to the RTL to work around these problems becomes unnecessary and can be removed. This makes the RTL far more manageable and extensible. The client part of WINDOWs with or without the MDI attribute is absolutely identical and is very close to the toolbar. There are a few minor differences, e.g., the client part of a WINDOW can be scrollable and setting focus to a toolbar’s controls is handled in special way. This allows us to share most of the code for the client part and for the toolbar. The separate client part can be “glued” to any rectangular area within the bounds of the client area of the non-client part of any WINDOW, for example, to a TAB control. That means the client part can be used as a compound custom control. It can be created multiple times, and every copy can be “glued” to different places without the necessity to duplicate the code. Implementation of such user-defined control could be coded as a class with a method to declare a client-part-only WINDOW and run it’s ACCEPT loop and methods to set or query values of any USE variables. Dockable toolboxes can be re-implemented in this same way. Probably, a new keyword will be added to the language for declaring client-part-only WINDOWs. The host WINDOW would provide a simple interface to inform the “glued” object about events like resizing. The functionality of REGION controls could be extended for handling that implementation. Alternatively we could introduce another new keyword for areas where client-part-only WINDOWs can be “glued”. The common part of a WINDOW object is created upon entry to the scope where a WINDOW is declared is the same for WINDOWs with and without the MDI attribute. This allows the possibility to change the type of non-frame WINDOWs at run time before opening them. C9 went into pre-release in the beginning of May. Now almost 20 weeks and 9 beta releases later, we are ready to release the official gold version. The next (gold) release has some additions and touch-ups in the docs, and a couple more fixes for recently found (important) issues. We project a release date for this coming Monday (9/23)! There is a lot more coming during the lifetime of C9, including new support for Touch gestures, the H5 project, a new Topscan, and much more. Additionally we have some big projects in the works which I have posted about today, and I’ll be going into the details of those projects, and other upcoming features at the upcoming DevCon in Orlando next week. The options to provide access to your Clarion program on non-PC devices now range from using RDP products, creating pure Web apps, or with @Thin or ClarioNet. And we’re going to be offering some more options for Clarion9 and Clarion.Net. Today I’m writing about a new product (internally named H5 Builder). H5 is a blend of the best features of Internet Connect (IC) and Web Builder (WB), joined with the jQuery family and HTML5/CSS. Both IC and WB were products ahead of their time. As an example IC was using an async data packet methodology to refresh client side pages before technologies like Ajax were on the drawing board. With the addition of a global template both IC and WB allowed Clarion apps to run over the internet without (hardly) any work at all from the developer. Drop in the template, remake the app, and deploy. However, they both had the same limitations; difficult (or impossible) to work with the web UI presentation to fit within existing web sites, and they required IIS experience. They also weren’t positioned properly. Developers who tried to use either product to create a “web site”, or create a web app that needed to scale to 100’s-1000’s of simultaneous users found neither could meet their requirements. H5 apps use the jQuery library, either jQuery UI or jQuery Mobile (UI), and JSON for updating client side data without a full page refresh. They run under the AppBroker SE, so you just install the service and deploy — no IIS knowledge required. 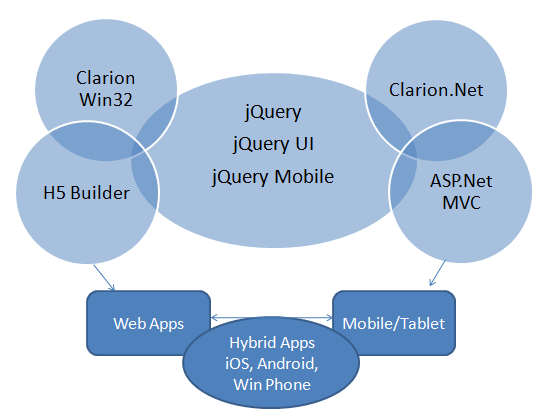 The use of the jQuery family of technologies will be shared with Clarion.Net. So becoming proficient with one group of technology will lead to being able to create web apps, mobile apps, native apps and hybrid apps. We’re currently working on updates for both Clarion 8 and Clarion.Net. On the C8 side we’re focusing on the first maintenance release for 2012 – lots of bug fixes and some popular feature requests. On the .Net side we’re working on the next iteration of the 3-tier templates for both desktop and ASP.Net apps. Additionally we’re adding the option to use the Clarion LINQ provider as the data model, bringing in ABC-like FILE access to your TPS (and other ISAM) tables. We’ve simplified the steps needed to create the 3-tier app such that running the wizard creates both the model and the base application – and attaches all required extensions automatically. End result – you won’t have to do much more than just select your Dictionary and then select the data model. And if you choose the Clarion.Linq model there is no ADO.Net connection to configure. We expect to release C8 next week to external testers, and a general release to follow the week after. We’ll be ready to release the updated T4 templates around the same timeline, and once we’ve firmed up the changes we’ll schedule a webinar on ClarionLive. The webinar will focus on how to use the templates (as opposed to how to write T4 templates). A new update is going out right now, and next week v8 installs will go out for all our add-on products; a gold release is likely within 1-2 weeks. After the gold release we’ll start to let loose some of the new features that are being done in the background, but are not yet ready for release to production.